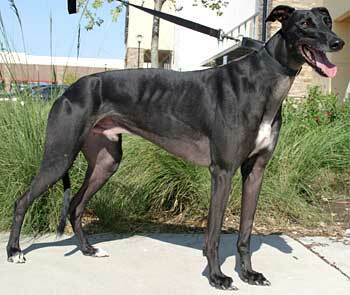 Shotgun, aka Slatex Shotgun, is a small, 3-year-old black male born July 24, 2004. His sire is Brett Lee and his dam is Slatex Shell. 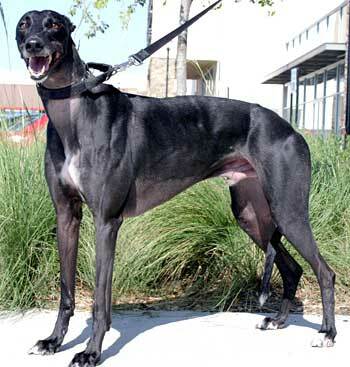 Shotgun has 24 races to his career credit, starting October 4, 2006 at the Woodlands in Kansas City and ending March 17, 2007 at Valley Race Park in Harlingen. 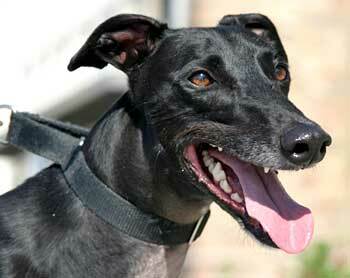 Shotgun was part of the 43 greys received on Easter Sunday 2007 at the closing of Valley Race Park. Shotgun doesn't seem to have much interest in cats. We did this slowly from being muzzled and on a leash to on-leash without a muzzle. Things are finally quiet in the house with all the dogs, and he's off-leash. He's made a couple of passes by Domino, who is on the floor. Now Dom has made a pass by him. Shotgun watches, but loses interest quickly. He passes his cat test, but as always, I recommend close supervision. What a sweet little cutie! If anyone is looking for a smaller male Greyhound to join their family, Shotgun is your dog! If good things come in little packages, then Shotgun might be the best gift you've ever gotten. Shiny Shotgun is no larger than most females, but he makes up for stature with a happy, infectious enthusiasm. He is the dog people notice, for when he is comfortable, he is curious and playful and affectionate. He is also shy in new situations, so his bubbly personality doesn't show at meets and greets. Shotgun loves walks and is much more a gentleman on a lead than previously. He still is a bit too enthusiastic when he first starts out on the walk, but more rapidly settles down now. He learned "wait" almost immediately, and learned that when another dog begins walking again, that is not his signal. His signal comes from his human companion. Shotgun also seems to know the word "car" and happily rides in a car as well. He does love to hunt squirrels outdoors, and would gladly chase outdoor cats as well. He definitely is interested in anything that moves. A careful introduction to indoor cats would seem in order, even though he passed his cat test as cat tolerant. We're guessing that he would learn a dog door pretty quickly, first because he is a smart boy, and secondly because he loves to just push the storm door open. (He hasn't yet mastered holding the door open for his female companions). He has been the perfect gentleman in the house, however, never trying to mark. He doesn't cruise the counters, although it is not wise to leave treats available to him in an open closet. Shotgun is a quick learner who learned after the first meal on which side he got fed. He loves getting his yogurt popsicles and his nighttime treats. He is learning to sit. Mostly he is a loving, affectionate companion, who is full of silly antics.